Targeted therapy is of particular interest where we are trying to dissect out what’s special about an individual with asthma, how we can recognise that with biomarkers, develop a treatment that’s targeted at that particular asthma and roll out treatments into clinical practice. Why did you get into respiratory research? My interest in respiratory research evolved through the patients that I saw during my medical training and the professors and doctors I had as my role models in Newcastle where I was training. I developed an interest in understanding asthma when I was seeing a lot of patients in hospital with asthma and trying to work out why they were getting sick and what we could do to help them. Professor Peter Gibson is a respiratory physician, clinical researcher and Co-Director of the HMRI Viruses, Infections/Immunity, Viruses and Asthma research program as well as Co-Director of the University of Newcastle’s Priority Research Centre (PRC) for Asthma and Respiratory Diseases. He is also the current President of the Thoracic Society of Australia and New Zealand. 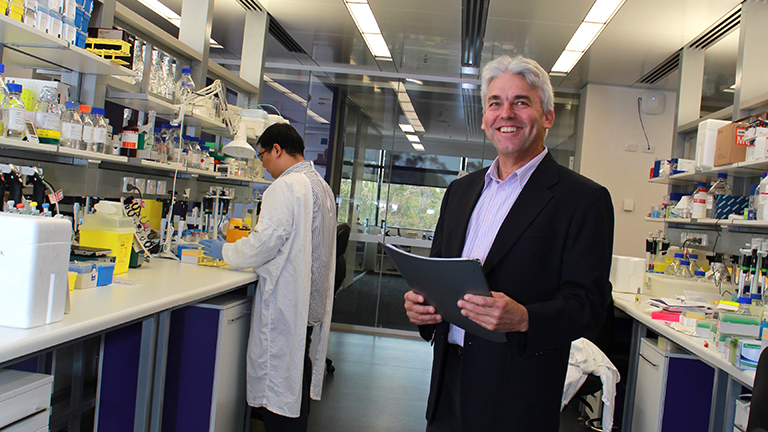 Throughout his career working at the clinical interface as a respiratory physician at the John Hunter Hospital, Professor Gibson has been able to inform his research into improving treatment regimens and management strategies for asthma and airway disease. Professor Gibson and his team are working to improve the management of asthma in pregnancy to better diagnose and optimise the use of effective treatments in pregnant women who may be otherwise reluctant to treat their asthma during pregnancy. He is also working to develop an accurate blood test to diagnose asthma separately and distinctly from chronic obstructive pulmonary disease (COPD). These are clinically difficult to distinguish and require very different treatments. Another major aspect of Professor Gibson’s research is to develop a new treatment for non-eosinophilic asthma with macrolide antibiotics. Eosinophils are a form of white blood cells in the immune system which are thought to exacerbate respiratory inflammation when expressed in excess in conditions such as asthma. This five-year, $2.9 million study is trialing an antibiotic on approximately 400 people in four cities and is the biggest study into non-eosinophilic asthma in the world. It is funded by the National Health and Medical Research Council. Professor Gibson has published more than 400 peer reviewed original research articles in high ranking journals and has presented at over 250 national and international conferences.